Learn the core, fundamental principles of yoga so you can practice confidently and safely at home or at a yoga studio. This is a 7-Week Digital Course with 1 Module delivered each week. Each module contains various workshops and presentations related to that Module. Each Module builds upon the previous one. You work at your own pace. And remember, you have lifetime access and receive any free updates. That means when I update the course, you automatically receive those updates. I will pass new information on to you that I learn and discover. And there is always more to learn! Can't wait for you to begin your yoga adventure! **Read terms and conditions for money-back guarantee terms. By purchasing any WHAT'S YOUR MUD LLC course and/or coaching or registering for a free offer or course, you, the registrant, agrees to the terms outlined below. Please also note in some offers you need to check the box to be added to WHAT'S YOUR MUD? 's email newsletter to receive important information about the course or service as well as any updates from WHAT'S YOUR MUD? You can unsubscribe at any time by clicking on the unsubscribe link included in every email. Please also note you may receive emails from WHAT'S YOUR MUD? after purchasing a product or service to help you access what you have purchased. You can unsubscribe at any time. 1. The registrant understands that yoga includes physical movements as well as an opportunity for relaxation, stress re-education and relief of muscular tension. As is the case with any physical activity, the risk of injury, even serious or disabling, is always present and cannot be entirely eliminated. If registrant experiences any pain or discomfort, he/she will listen to their body, adjust the posture and seek support when needed. Yoga, Ayurveda and Coaching is not a substitute for medical attention, examination, diagnosis, or treatment. Yoga is not recommended and is not safe under certain medical conditions. 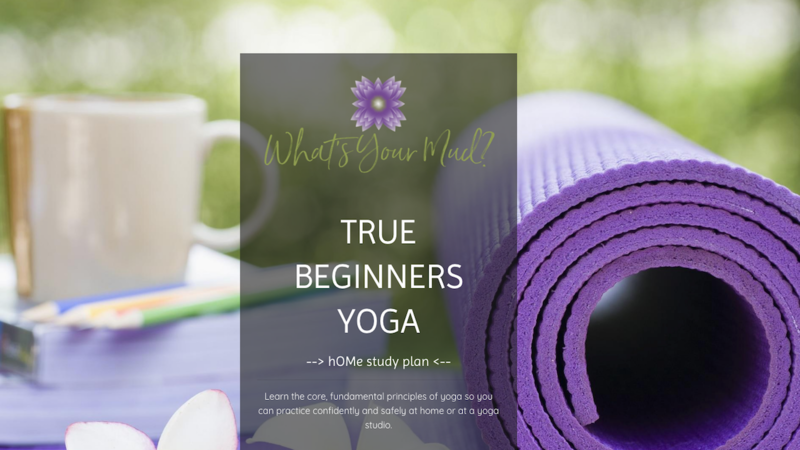 Registrant affirms that he/she alone is responsible to decide whether to practice yoga.This same responsibility of the registrant applies to any other course or program or coaching or membership or any other offer they purchase for a fee or for free from WHAT'S YOUR MUD LLC. The registrant understands that it is his/her responsibility to seek professional help when needed. Registrant hereby agrees to irrevocably release and waive any claims that she/he have now or hereafter may have against WHAT'S YOUR MUD LLC. 2. Any WHAT'S YOUR MUD LLC courses purchased or free memberships are to be used by the purchaser alone and are non-transferable. Purchase of any one WHAT'S YOUR MUD LLC course or registration for a free offer or course or coaching is meant for use by one participant only. Sharing content either by duplicating PDFs, MP3s, and or Video is considered a violation of copy right. Please respect the time and work that has gone into producing WHAT'S YOUR MUD LLC products and services. During the first 2 weeks of purchasing and participating in any WHAT'S YOUR MUD LLC course that is for a fee, the participant can request a full refund. After the 2 week period, no refunds will be given. Participant is responsible for asking for a refund by emailing [email protected] before the 2-week period ends. The 2-week period begins the day the course is purchased, Day 1, and ends on midnight EST 13 days later, on Day 14. There will be no refunds given after the 2-week period. Pertaining to any coaching packages or services purchased, once the first service or coaching session has started, no refunds will be given. There is a cancellation fee of $30 if the service or coaching session is cancelled within 12 hours of the session start time.